The Easi-Speak MP3 recorder/player can record voices, sounds or music. 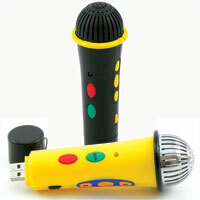 Made to look like a microphone it enables pupils to become a reporter or singing star, without requiring a PC. Providing innovation for early years learning these devices are very popular in many primary schools. Built in memory of 128MB for high quality sound recording time of up to 4 hours. Uses common audio formats such as WAV and MP3. Cordless microphone with simple battery charging via USB. Winner of a Gold Practical Pre-School Award 2009. Give those quiet children a voice by recording in private where there is less pressure and then playback to the group. If you are interested in ordering Easi Speak Microphones for your school then please contact us. Schools can simply provide an official purchase order and pay by invoice with a 30 days credit facility.